Dan Douglas is a Toronto born Trombonist and euphonium player who has been steadily working in the Toronto jobbing and Jazz scene for over 20 years. As an avid student, Dan began playing professionally while in high school and was quick to move up the ladder. His musical studies took him to Toronto’s famous Humber College where he refined his technique and found out the importance of knowing “lots of tunes”. 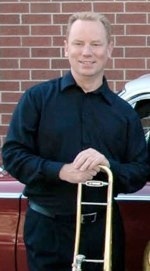 Dan plays regularly with the Galaxy All Star Orchestra as a featured soloist and singer. He is a member of the Alley Cats band led by Alex Pangman and has also appeared with Jeff Healey and the Jazz Wizards in concerts around Ontario and Quebec. Dan is the co-leader of the Dixie Demons. Dan also plays with many other local bands including Bob DeAngelis, Taylor Made, The Starlight Orchestra and Robin Langdon. He has recorded with artists such as Kevin Breit, Eddie Graf, George St. Kitts, Jeff Healey, Lenny Graf, Alex Pangman and others. Ross Wooldridge was born 1962 in Hamilton Ontario. He showed early musical ability, and was taking piano lessons by age four. 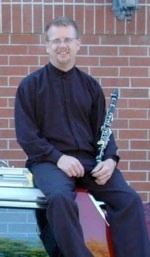 He was self taught on clarinet at age 13, and took saxophone at Ancaster High and Vocational School. Ross also picked up the flute while attending Mohawk College and Humber College, where he honed his skills as a multi instrumentalist and arranger. After finishing his education, he added to his portfolio of skills the titles of producer, conductor, transcription specialist and teacher. Ross enjoys co-leading the Dixie Demons with Dan Douglas, as well as a busy career of playing and recording with Alex Pangman and her Alley Cats, Jaymz Bee and the Royal Jelly Orchestra and many other local artists. Another of his notable achievements is his critically acclaimed Tribute to Benny Goodman Sextet, and additionally he is the co-leader/musical director of Toronto's Galaxy All Star Orchestra. Ross has performed with and arranged music for a number of international stars, among them Ben E. King, and the Drifters. 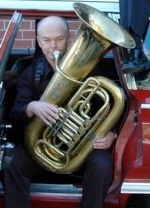 Phil has been a freelance musician in the Toronto scene since the early 80s. His versatility has taken him down a wide variety of avenues. With a Diploma in Music Performance at Humber College, Phil has played Jazz for decades. Also trained classically, he is amongst those rare players who can bridge the gaps between styles. You could hear Phil perform one day in his classical guitar and flute duo “Ambiance”, and the next day you might hear him with the Dixie Demons playing traditional jazz on the banjo! He got his first professional work playing banjo in a ragtime show at a local theme park. Shortly thereafter, Phil was recruited by Dan Douglas and Ross Wooldridge to join the Dixie Demons, thus helping to create the first incarnation of the band. Phil’s wide range of musical experience fuels his passion and enhances his abilities as a producer. Through the years, he has produced a number of CD and demo recordings of many styles. As a composer Phil has two original CDs to his credit. It was with much pleasure that Phil joined Ross and Dan in the production of the Dixie Demons' debut CD, “Live At The Rex”. 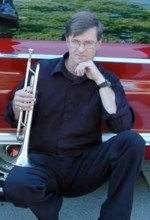 Stephen has been working as a professional trumpet player in and around Toronto for over 20 years. He has played with some of the world’s greatest entertainers from Bob Hope to Michael Buble. He has worked in big bands, ethnic music, recordings, jazz, radio, television, teaching at Humber College, and theatre shows ranging from Cats to the recent production of Wicked. Steve enjoys playing with the Dixie Demons when his busy schedule allows and has been the band's principal trumpet player for years. Steve is a graduate of Ryerson Polytechnical Institute, Humber College, and the Orr Lake school of musical jobbing. Stephen credits his family, especially his parents, and renowned brass guru Don Johnson for their unending support and for making this career in music a reality. Doug Burrell has been performing professionally in the Greater Toronto Area since the late 1970's. He is much in demand both as a jazz tubist and as a classical artist having played with numerous ensembles including Borgy's Banjo Reunion, the Juno Award winning NOJO jazz orchestra, The Dixie Demons , the Brian Barlow Brass and Drums and Jeff Healey's Jazz Wizards. Doug has performed in a number of Jazz Festivals including the Montreal Jazz Festival, the Toronto Beaches Jazz Festival, the Northumberland Jazz Festival, the Markham Jazz Festival and the Umbria Jazz Festival in Orvieto Italy. Doug also performs as a classical musician, playing with a number of brass ensembles and orchestras in the Toronto area. Chris Lamont is a drummer who has been experimenting with various styles of music from rock to traditional jazz since the age of eight. He has been working extensively both live and in the studio with New Orleans trumpet man Kevin Clark, known for his time with the Dukes of Dixieland and the New Orleans Nightcrawlers. Other recent credits include EMI recording artist Damhnait Doyle, Nettwerk recording artist Martina Sorbara, and the legendary Sass Jordan. Chris has been rapidly becoming one of Toronto’s most versatile and in-demand session drummers. Chris has had a wide range of musical experience, working with artists such as jazz great Peter Appleyard, Canadian blues icon Jeff Healey, the first "Canadian Idol" champion and BMG recording artist Ryan Malcolm, Bill Dillon (Peter Gabriel, Robbie Robertson), Jamie Oakes (Tom Cochrane, Marc Jordan), Alex Pangman and her Alleycats , Harrison Kennedy (Chairmen of the Board), Dale Martindale (Images in Vogue), The Greg Bush Quintet, The Dixie Demons, and many others. Chris endorses Taye Drums and Sabian cymbals.